Melt butter in pan on medium. Add garlic, ginger and cinnamon sauteing for 1 minute. Stir in rice sautee for 2 minutes. Add sugar, salt, pepper, water, and coconut milk bring to simmer. Stir, cover, reduce to low and simmer 15 minutes. Fluff, cover, let set 4 minutes. 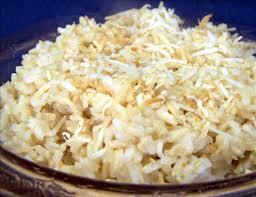 Serve and garnish with toasted coconut.